Purpose: Our study aimed to investigate and compare the effectiveness of general and toric orthokeratology lenses in corneal toricity using the vector analysis. Methods: A retrospective observational study was carried out. 19 patients, 37 eyes, (spherical group) were fitted with spherical ortho-k lenses and 15 patients, 30 eyes, (toric group) were fitted with toric ortho-k lenses. Data collection was performed at baseline and 1 d, 1 week, 1 month, 3 months after the commencement and included visual acuity, corneal topography, axial length and biomicroscopy examinations. Changes in corneal toricity were evaluated using vector analysis. Results: Ortho-k significantly reduced the manifest myopia and improved UCVAs in both groups after 1 d, 1 week, 1 month and 3 months of lens wear. The median subjective myopia of spherical group and toric group at base line was -3.85 ± 1.29 D and -3.66 ± 1.69 D (P>0.05). After wearing ortho-k lenses for 1 d, 1 week, 1 month and 3 months, the UCVAs improved steadily in both groups, the differences between the two groups were insignificant in 1 d, 1 week, 1 month, but with significant difference only in 3 months (0.07 ± 0.05 vs. 0.00 ± 0.07, P<0.05). The corneal J0 vector values were -0.98 ± 0.60 and -1.19 ± 0.25 D (P>0.05) and the J45 vector values were 0.09 ± 0.20 and 0.09 ± 0.46 D (P>0.05), respectively. The differences of corneal J0 vector values between the two groups were significant for all the time points (t=-3.34, -1.94, -1.41, -1.82, P<0.05). The differences of corneal J45 vector values between the two groups were not significant. The percent of patients in spherical group and toric group who reported visual disturbance symptoms were 15% and 0%, respectively. Conclusions: For low-moderate myopias with moderate-high astigmatism, despite the similar UCVAs achieved in two groups, Toric design lens were more effective in reducing corneal toricity. Myopia, Corneal toricity, Spherical ortho-k, Toric ortho-k. Myopia is a common ocular disorder and has been particularly conspicuous in East Asia], especially in China [1-6]. Recent reports have shown orthokeratology lenses to be effective in slowing the progression of myopia in children [7-9]. The contact lenses are designed with a “reverse geometry” in which the curvature in the center is flatter than that at the periphery . After an overnight wear and removal upon waking up, Uncorrected Visual Acuity (UCVA) can be temporarily improved in the daytime, and the progress of myopia can be controlled [11,12]. Orthokeratology lenses work best for patients with myopia no more than -6.00 D and astigmatism no more than 1.50 D. Patients meet these two criteria have a relatively high chance of achieving satisfactory effects . However, the prevalence of astigmatism is as high as that of myopia. The incidence of astigmatism was about 33.6% in Asian children aged 5-17 y and this value significantly increases with age [14-16]. Although spherical design orthokaratology lenses are effective in correcting low-moderate myopia with low corneal astigmatism, the efficacy and safety in the treatment of patients with myopia complicated by moderate to high astigmatism are still unknown . We prescribed orthokeratology lenses for the correction of myopia combined with moderate to high astigmatism for 24 patients with the two designs: Spherical and Toric, and investigated the changes in corneal astigmatism, the stability in the wearing of the two lenses and the safety in clinical settings after wearing orthokeratology lenses. The inclusion criteria for subjects were as follows: (1) Age between 8 and 45 y; (2) Myopic refractive error of ≤ -6.00 diopters and corneal astigmatic refractive error of 1.50 to 3.50 D; (3) Radius of corneal curvature within the range of 39.00 to 46.00 D; (4) Ability to follow instructions during the clinical trial; (5) Willingness to participate in the clinical trial and provide written consent; (6) All subjects had no contraindication for orthokeratology lens wear and did not have any past corneal refractive surgery. A total of 34 adolescents (67 eyes) who visited our hospital from March 2014 through June 2015 were enrolled, among which 19 cases (37 eyes) were assigned to the spherical orthokeratology lenses group (the spherical group) which included 4 males and 15 females, and 15 cases (30 eyes) were assigned to the toric orthokeratology lenses group (the toric group) which included 4 males and 11 females. This study was in compliance with the tenets of the Declaration of Helsinki. Subjects and their patients were fully informed of the risks and benefits of the procedure and agreed to the treatment protocol. This study was designed to be double blinded, and neither researchers nor subjects knew the design. For group I, Spherical orthokeratology lenses supplied by Oupu Kang Technology China Inc. (Hefei Province, PRC) were used, a four-zone reverse geometry design of the inner surface. For group II, Lucid Korea orthokeratology lenses for astigmatism were used. A toric design was used for the Reverse curve and the Alignment curve, with a toric specification of CP100-200 (Table 1). Not obvious complications orthokeratology lens were observed. Table 1: Characteristics of the orthokeratology lenses used in the trial. Examinations: At the first visit (1 d), Uncorrected Visual Acuity (UCVA), Best Corrected Visual Acuity (BCVA) and manifest refractive error were measured using a phoropter (Nidek Co., Ltd., Japan) at cycloplegic visits. Intraocular pressures were measured with a non-contact tonometer (Topcon Co., Ltd., Japan). Axial lengths were monitored using the IOLMaster (Carl Zeiss AG, Germany). Anterior segments and fundi were examined using slit-lamp microscope and funduscope. Measurement of corneal astigmatism: Corneal curvature, corneal astigmatism and axial direction were measured using computer-aided corneal topography (Allegretto Wave, Germany). The subjects were asked to blink normally to avoid the disruption of tear film, open the eyes widely after the last blink, and fixate on the target during the image acquisitions. Images were automatically captured and the best images were recorded. Photos of the corneas were taken with a 24-ring keratoscope. Then the keratoscopic images were converted to refractive powers using a computer program. The subtractive maps between pre and post were used to determine lens centration and the size of treatment zone (tangential maps) and the amount of corneal flattening (refractive maps). Orthokeratology lens fitting: Fit was confirmed during slitlamp microscopy. The targeted ideal fluorescein pattern was characterized by a central zone of light touch (3.0 to 3.5 mm diameter), surrounded by a wide deep doughnut-shaped tear reservoir, a zone of peripheral light touch, and peripheral clearance, with lens movement of 1 to 2 mm on blink. If the fitting showed a poor response, the trial lenses were adjusted with new parameters. And an overnight trial-lens wearing would be done as necessary. Unless the corneal response showed a bull’s pattern at an overnight visit, the lens prescription was issued . When the lenses came back, patients were instructed on how to wear and take care of the lenses, and were informed of the schedule for follow-up visits. Re-checks: The first visit took place 1 d after wearing the orthokeratology lenses overnight. Both UCVA and refractive error were measured. UCVA was measured once per day at the same time of each day (10 am). Corneal topography, axial length, intraocular pressures and examination of cornea and conjunctiva were performed. The same tests were repeated after 1, 2 weeks and 1 month of lens wear. The follow-up visits were carried out once a month through 6 months and then every 3 months. Corneal astigmatism was converted to rectangular vector coordinates. Where C denotes the amount of astigmatism at axis θ, J0 and J45 are the horizontal or vertical and oblique components of astigmatism respectively. Changes in astigmatism were evaluated by comparing corneal toricity as well as J0 and J45 before and after ortho-K treatment using vector analysis [19,20]. The component J0 indicated astigmatism along the horizontal and vertical direction. J45 indicated oblique astigmatism from a 45-degree angle. Such calculation method takes a with-the-rule astigmatic change as a positive value and an against-the-rule astigmatic change as a negative value. The results can directly reflect astigmatic changes based on directions, and can also avoid potential errors that may be caused by neglection of the directions of astigmatic changes when simply applying subtraction [21,22]. Retrospective observational study was adopted. Data were expressed as x̄ ± s. Because the distribution of data were not significantly different from normal (Kolmogorov-Smirnov tests, p>0.05), parametric tests were used to compare J0 and J45. Repeated measures analysis of variance (ANOVA) was used to study the changes in the parameters after ortho-k lens wear. Comparative analysis of corneal toricity and UCVA between the two groups at various time points after putting on different-design orthokeratology lenses was conducted using the independent-sample T-test in SPSS 22.0. For all statistics, a p-value<0.05 was indicated statistically significant difference. All 34 cases initially enrolled in this study have completed the 3-month follow-up visit. The pre-ortho-k refractive sphere of Group I (spherical group) ranged from -1.00 to -5.75 diopters sphere, and the refractive astigmatism ranged from -1.00 to -3.00 DC, and Group II (toric group) refractive sphere ranged from -1.25 to -6.25 diopters sphere and the refractive astigmatism ranged from -1.00 to -3.25 DC. The spherical power of Group I and Group II before wearing the lenses were -3.85 ± 1.29 D and -3.66 ± 1.69 D respectively, without statistically significant difference (t=-0.53, P=0.60>0.05); the cylindrical powers were -1.76 ± 0.79 D and -1.88 ± 0.88 D respectively, without statistically significant difference (t=2.50, P=0.065>0.05). The average base curves of the lenses worn by the two groups were 8.92 ± 0.37 mm (8.23-9.58 mm) and 8.07 ± 0.64 mm (7.46-9.71 mm) respectively. Mean ± SD UCVA (logMAR) of Group I and Group II after the first overnight, 1 week, 1 month of lens wear not significantly different. UCVA at 3rd month was significantly different between the two groups (Table 2 and Figure 1). Table 2: Mean ± SD UCVA logMAR values measured during the 3-month orthokeratology treatment of the two groups. Figure 1: UCVA after orthokeratology lens wear of the two groups. Changes in J0 of corneal toricity: Table 3 showed the changes in the corneal toricity of the two groups before and after ortho-k treatment. There were no statistical differences before ortho-k lens wear of the two groups (independentsample T-test, p>0.05). Significant reductions at subsequent visits were observed in Group II (repeated measures ANOVA, p<0.05). No significant changes were observed in Group I (repeated measures ANOVA, p>0.05). Table 3: Mean ± SD corneal toricity before and after orthokeratology and their mean changes of the two groups. There were significant differences between the two groups at the following visits respectively (independent-sample T-test, p>0.05) (Table 3 and Figure 2). A sudden increase in J0 was observed in group II, and this increase may be caused by specific stimulus. At 3 months after lens wearing, the decrease rates (the proportion of magnitude of decrease in astigmatism to the original astigmatism) of J0 component were 6% and 61% respectively in group I and group II. Figure 2: Corneal torocity (J0) before and after orthokeratology lens wear of the two groups. Changes in J45 of corneal toricity: No significant changes were observed in the two groups (repeated measures ANOVA, p>0.05).The were no statistical differences before and after ortho-k lens wear of the two groups (independent-sample Ttest, p>0.05) (Table 3). At the first overnight visit, corneal staining was observed in 32% and 29% of subjects in Group I and Group II. No significant corneal staining (staining<grade 2) was observed in the subsequent visits at 3 months in both groups. Four patients (14.8%) in Group I complained of double and blurred vision, while no significant vision abnormality was reported from Group II. During the 3-month lens wear, no dimple veiling and no pigmented arc were observed and no adverse events were noted in any subject. None of the patients of the two groups dropped out due to an adverse reaction. A number of clinical trials have certified that orthokeratology can reduce moderate to high myopia and control myopiaprogression [23,24]. Orthokeratology is a reversible method used to correct vision and change the corneal curvature using a polymethyl methacrylate contact lens . With the development of contact lenses, which have high oxygen permeability, potential for side effects during sleep has decreased significantly . The inner surface of lens can press the center of the corneal to reshape the cornea, so as to correct myopia for a temporary period and the vision can be improved. Orthokeratology lenses must be precisely stabilized at the center of the corneal. De-centration may results in an increase in high order aberrations, which affect the visual quality [27,28]. In addition, several clinical reports have addressed the insufficiency of the astigmatism correction using orthokeratology lenses due to lens de-centration . It is difficult to place the lens at the corneal center in patients with astigmatism resulting from a difference in two corneal curvature . So, toric orthokeratology lenses are designed to have more than two aspherical curvatures to match the corneal surface precisely [31,32]. The special design can be used for In 2012, Chen et al. conducted a clinical study in which subjects aged 6 to 12 y old with myopia of 0.50 to 5.00D and with-the-rule astigmatism of 1.25 to 3.50 D were fitted with toric orthokeratology lenses . The astigmatism was decreased from 1.91 ± 0.64 to 0.40 ± 0.39 D (p<0.0001) after 1 month of lens wear. In another study, the mean astigmatic refractive error of 23 subjects (39 eyes) was reported to be changed from 2.07 ± 0.83 to 1.44 ± 0.99 D (p=0.001) after wearing toric orthokeratology lens for 4 weeks . These published articles evaluated the mean change in astigmatism, but there is an increasing use of vector analyses to account for the directional effect of astigmatism [9,34]. Three vector analyses have usually been described for the analysis of astigmatism change: the Bailey-Carney vector analysis, in which the orientation of the axis of the astigmatism is qualitatively but not quantitatively calculated . The Alpins vector analysis is used in refractive surgery, which provides indices regarding the success of the treatment and only addresses changes . In this study, Thibos vector analysis was used to analyze preand post-orthokeratology astigmatism as well as changes in them [19,20]. J0=(-C/2) cos (2θ) and J45=(-C/2) sin (2θ), where C denotes the amount of astigmatism at axis θ and J0 and J45 are the horizontal/vertical and oblique components of astigmatism respectively. Similar results of this paper were obtained if changes to astigmatism were analyzed using power vectors. Before wearing the lenses we found no statistical significance in J0 and J45 between the two groups. Significant reductions of corneal toricity J0 at subsequent visits were observed in Group II from -1.19 to -0.46 (repeated measures ANOVA, p<0.05). No significant changes were observed in Group I of corneal toricity J0 from -0.98 to -0.92 (repeated measures ANOVA, p>0.05). There were significant differences between the two groups at the following visits respectively. And slight changes in J45 were found in both subjects and the observed changes were not clinically significant (independent-sample T-test, p>0.05). 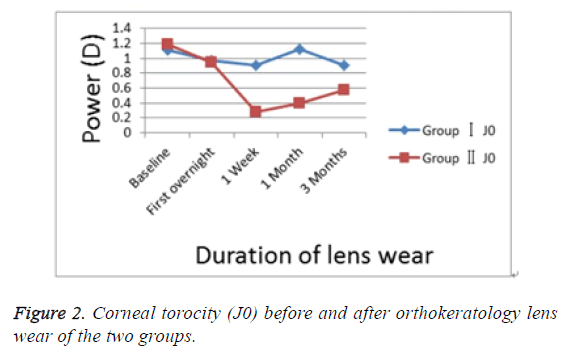 At 3 months after lens wearing, the decrease rates of J0 component were 6% and 61% respectively in group I and group II, which were basically consistent with the % decrease rate of astigmatism after wearing toric orthokeratology lenses reported by Chen et al. [31,37]. Our results suggest that toric orthokeratology is effective in the treatment of patients with both myopia and astigmatism. Corneal toricity reductions were only observed in Group II but not in Group I. Although slight differences in mean ± SD UCVA were found between two groups at 1-night, 1-week and 1-month visit, were a litter different differences were not statistical significant (P>0.05). At 3-month the mean ± SD UCVA was better in Group II (0.00 ± 0.07) than in Group I (0.07 ± 0.05) (P=0.01). 4 patients (14.8%) in the spherical group I complained of double and blurred vision, while no significant vision abnormality was reported from the toric group II, which was consistent with previous reports . Orthokeratology lenses cause change in the morphology of the cornea, flattening of the central base curve zone and increase of refractive power in the reverse curve, which increases astigmatic aberration. Displacement of the lenses can cause deformation in the anterior surface of the cornea, shrinking of diameters and shift of location of corneal optical zones after shaping of the cornea, irregular increase of the corneal surface, more obvious increase of astigmatic aberration, resulting in glare, false image, double vision and other visual disturbance [13,38]. Lenses with a toric design can effectively improve fitting in moderate to high corneal astigmatism, alleviate corneal astigmatism and reduce the chance of visual discomforts and symptoms after removing the lenses, and improve the quality of vision. The lenses used for the two study groups were supplied by different manufacturers, and pressures and forces of gravity vary with the different designs of the lenses, which could have somewhat affected the results of this study. Corneal staining associated with orthokeratology lens wear is a common complication, and mechanical trauma and hypoxia in the corneal epithelium have been proposed to be likely causes. Excessive clinical intervention should be avoided for corneal staining without complicated infection [39,40]. According to our observation, the incidence of corneal staining (grade 1) at 1 day after initiation of lens wearing was 32% and 29% respectively in the spherical group and the toric group, and no corneal staining had occurred in either group up to 3 months. The incidence of grade 1 corneal staining after an overnight wear was basically consistent with previous reports: 40% in the spherical group and 23% in the toric group [41,42]. During the follow-up period, no pigmentation ring, neovascularization, corneal ulcer or any other severe complication was seen in either group. In addition to the highly oxygen-permeable materials used in making orthokeratology lenses, the stringent implementation of optometry and fitting technologies and the strict control of length of wearing, and the detailed instruction and follow-up system can effectively prevent complications such as corneal edema and infection. So far, literatures reporting the association between astigmatism and the progress of myopia are limited. In a study conducted by Saw et al. in children aged 6-11 y, no difference was observed in the progress of myopia between the group with astigmatism (>0.50 D astigmatism) and the group without astigmatism . Fan et al. investigated the association between astigmatism and the increase in diopters of refractive errors in Asian children aged 3-6 y, but their study subjects were mostly children with hyperopia . Cho et al. from Hong Kong Polytechnic University compared their study results with those from TO-SEE and ROMIO studies and drew a conclusion that the progress of myopia was not affected by the initial level of astigmatism, but was associated with approaches of vision correction, with slower increase of axial lengths in patients wearing orthokeratology lenses than in patients wearing single-vision frame glasses [45,46]. This study had an observation period of only 3 months. The difference in axial lengths before and after wearing the lenses was of no statistical significance in either group. Further observation is needed to find out whether toric orthokeratology lenses can effectively control the increase of axial lengths. With selection of a proper lens design based on the patient’s own conditions and implementation of detailed instruction and stringent periodic follow-ups, orthokeratology lenses can effectively reduce myopia and astigmatism. By further optimization of vision quality under the premises of improving visual acuity and ensuring safety, orthokeratology will play a better role in clinical settings. Pan CW, Ramamurthy D, Saw SM. Worldwide prevalence and risk factors for myopia. Ophthalmic Physiol Opt 2012; 32: 3-16. Lam CS, Lam CH, Cheng SC. Prevalence of myopia among Hong Kong Chinese school children: changes over two decades. Ophthalmic Physiol Opt 2012; 32: 17-24. Pan CW, Wong TY, Lavanya R. Prevalence and risk factors for refractive errors in Indians: the Singapore Indian Eye Study (SINDI). Invest Ophthalmol Vis Sci 2011; 52: 3166-3173. Liu HH, Xu L, Wang YX. Prevalence and progression of myopia retinopathy in Chinese adults: the Beijing Eye Study. Ophthalmol 2010; 117: 1763-1768. He M, Zheng Y, Xiang F. Prevalence of myopia in urban and rural children in mainland China. Optom Vis Sci 2009; 86: 40-44. Zhang M, Li L, Chen L. Population density and refractive error among Chinese children. Invest Ophthalmol Vis Sci 2010; 51: 4969-4976. Kakita T, Hiraoka T, Oshika T. Influence of overnight orthokeratology on axial elongation in childhood myopia. Invest Ophthalmol Vis Sci 2011; 52: 2170-2174. Cho P, Cheung SW, Edwards M. The longitudinal orthokeratology research in children (LORIC) in Hong Kong: a pilot study on refractive changes and myopic control. Curr Eye Res 2005; 30: 71-80. Walline JJ, Rah MJ, Jones LA. The children’s overnight orthokeratology investigation (COOKI) pilot study. Optom Vis Sci 2004; 81: 407-413. Nichols JJ, Marsich MM, Nguyen M. Overnight orthokeratology. Optom Vis Sci 2000; 77: 252-259. Hiraoka T, Kakita T, Okamoto F. Long-term effect of overnight orthokeratology on axial length elongation in childhood myopia: a 5-year follow-up study. Invest Ophthalmol Vis Sci 2012; 53: 3913-3919. Santodomingo-Rubido J, Villa-Collar C, Gilmartin B. Myopia control with orthokeratology contact lenses in Spain: refractive and biometric changes. Invest Ophthalmol Vis Sci 2012; 53: 5060-5065. Yang Li-Na, Xie Pei-ying. Toric design orthokeratology contact lenses and visual quality. Chin J Optom Ophthalmol Vis Sci 2013; 15: 79-83. Fan DS, Rao SK, Cheung EY. Astigmatism in Chinese preschool children: prevalence, change, and effect on refractive development. Br J Ophthalmol 2004; 88: 938-941. Kleinstein RN, Jones LA, Hullett S. Refractive error and ethnicity in children. Arch Ophthalmol 2003; 121: 1141-1147. Yoon KC, Mun GH, Kim SD. Prevalence of eye diseases in South Korea: data from the Korea National Health and Nutrition Examination Survey 2008-2009. Korean J Ophthalmol 2011; 25: 421-433. Cheung SW, Cho P, Chan B. Astigmatic changes in orthokeratology. Optom Vis Sci 2009; 86: 1352-1358. Mountford J, Noack D. Corneal topography and orthokeratology: post-fit assessment. Contact Lens Spectrum 2002; 17: 6. Thibos LN, Wheeler W, Horner D. Power vectors: an application of Fourier analysis to the description and statistical analysis of refractive error. Optom Vis Sci 1997; 74: 367-375. Thibos LN, Horner D. Power vector analysis of the optical outcome of refractive surgery. J Cataract Refract Surg 2001; 27: 80-85. Deal FC Jr, Toop J. Recommended co-ordinate system for thin spherocylindrical lenses. Optom Vis Sci 1993; 70: 409-413. Mc Kendrick AM, Brennan NA. Distribution of astigmatism in the adult population. J Opt Soc Am A Opt Image Sci Vis 1996; 13: 206-214. Downie LE, Lowe R. Corneal reshaping influences myopic prescription stability (CRIMPS): an analysis of the effect of orthokeratology on childhood myopic refractive stability. Eye Contact Lens 2013; 39: 303-310. Swarbrick HA, Alharbi A, Watt K. Myopia control during orthokeratology lens wear in children using a novel study design. Ophthalmol 2015; 122: 620-630. Lui WO, Edwards MH, Cho P. Contact lenses in myopia reduction: from orthofocus to accelerated orthokeratology. Cont Lens Anterior Eye 2000; 23: 68-76. Hiraoka T, Furuya A, Matsumoto Y, Okamoto F, Sakata N, Hiratsuka K, Kakita T, Oshika T. Quantitative evaluation of regular and irregular corneal astigmatism in patients having overnight orthokeratology. J Cataract Refract Surg 2004; 30: 1425-1429. Hiraoka T, Okamoto C, Ishii Y, Kakita T, Oshika T. Contrast sensitivity function and ocular higher-order aberrations following overnight orthokeratology. Invest Ophthalmol Vis Sci 2007; 48: 550-556. Mountford J, Pesudovs K. An analysis of the astigmatic changes induced by accelerated orthokeratology. Clin Exp Optom 2002; 85: 284-293. Chen CC, Cheung SW, Cho P. Toric orthokeratology for highly astigmatic children. Optom Vis Sci 2012; 89: 849-855. Chen C, Cheung SW, Cho P. Myopia control using toric orthokeratology (TO-SEE study). Invest Ophthalmol Vis Sci 2013; 54: 6510-6517. Byul Y, Kyu Yeon H, Sun Young K, Su Young K, Kyug Sun N. Effectiveness of toric orthokeratology in the treatment of patients with combined myopia and astigmatism. Korean J Ophthalmol 2016; 30: 434-442. Bailey IL, Carney LG. Analyzing contact lens induced changes of the corneal curvature. Am J Optom Arch Am Acad Optom 1970; 47: 761-768. Alpins N. Astigmatism analysis by the Alpins method. J Cataract Refract Surg 2001; 27: 31-49. Chen C, Cho P. Toric orthokeratology for high myopic and astigmatic subjects for myopia control. Clin Exp Optom 2012; 95: 103-108. Hiraoka T, Okamoto F, Kaji Y. Optical quality of the cornea after overnight orthokeratology. Cornea 2006; 25. Sridharan R, Swarbrick H. Corneal response to short-term orthokeratology lens wear. Optom Vis Sci 2003; 80: 200-206. Mika R, Morgan B, Cron M. Safety and efficacy of overnight orthokeratology in myopic children. Optometry 2007; 78: 225-231. Rah MJ, Jackson JM, Jones LA .Overnight orthokeratology: preliminary results of the Lenses and Overnight Orthokeratology (LOOK) study. Optom Vis Sci 2002; 79: 598-605. Tahhan N, Du Toit R, Papas E. Comparison of reverse-geometry lens designs for overnight orthokeratology. Optom Vis Sci 2003; 80: 796-804. Saw SM, Nieto FJ, Katz J. Factors related to the progression of myopia in Singaporean children. Optom Vis Sci 2000; 77: 549-554. Fan DS, Rao SK, Cheung EY. Astigmatism in Chinese pre-school children: prevalence, change, and effect on refractive development. Br J Ophthalmol 2004; 88: 938-941. Cho P, Cheung SW. Retardation of Myopia in Orthokeratology (ROMIO) Study: a 2-year randomized clinical trial. Invest Ophthalmol Vis Sci 2012; 53: 7077-7085.